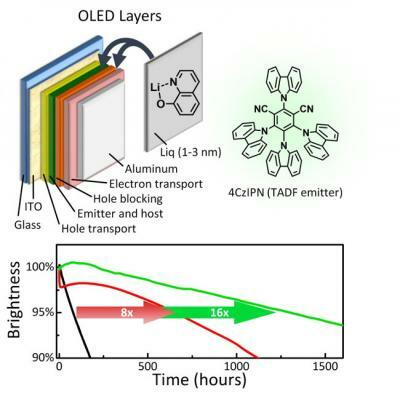 Researchers from Kyushu University managed to drastically increase the lifetime of TADF OLED emitters - by more than eight times. This was achieved by a simple modification to the structure of the device - putting two thin (1-3 nm) layers of Liq (a lithium-containing molecule) on each side o the hold blocking layer. The researchers started with a TADF device, in which the lifetime is only about 85 hours (LT95). This is under "extreme brightness" to accelerate testing. With the new design and some extra modifications, the device's lifetime increased to 1,300 hours - over 16 times better than the initial device. This is a great achievement - even though this is not enough for commercialization yet. The researchers say that this modification can also be used to increase the lifetime of regular phosphorescent OLEDs used commercially today. It will be interesting to see if this this development can be commercialized soon! The main research in TADF emitters is towards efficient blue emitters. Kyushu University recently spun-off a new company, called Kyulux to commercialize the TADF emitters - aiming to have emitters ready by 2018. You can read more about Kyushu's TADF emitters here, and we also host an OLED Auditorium presentation from Prof. Adachi here. Kyushu University isn't the only TADF emitter developer. German Cynora is developing efficient blue TADF OLED emitters, and in March 2015 the European Commission launched a new project called Phebe that aims to develop and commercialize TADF emitters.